Knife sharpening for NON-KITCHEN fixed blade knife under 5" in length. The 0536RWS Buck Open Season Skinner - from the popular Open Season Series, features a 4 1/2 inch drop point fixed blade made 420HC stainless steel, .150 inch thick, with a notched thumb rest for secure grip. The red wood handle has full tang construction for strength; milled texturing and a pronounced choil for secure purchase, and a lanyard hole. A black heavy duty polyester sheath is included. 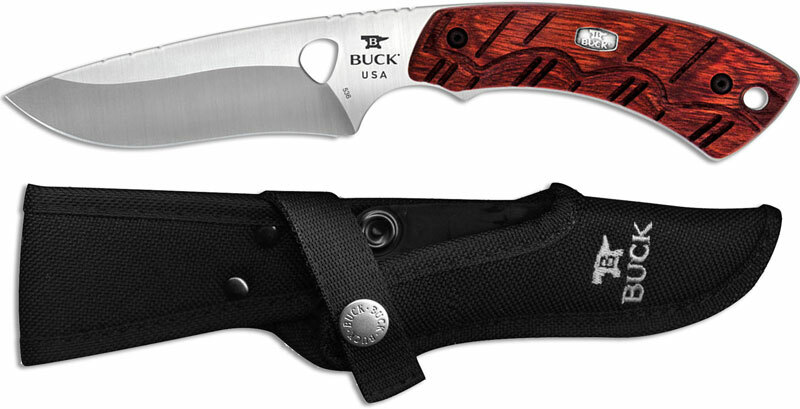 The Buck Open Season Skinner has an overall length of 8 1/4 inches, and it weighs 4.9 ounces. Proudly made in the USA. From the Buck website: The newly, redesigned Open Season® Avid Series combines all the right tools for a successful season. Made from quality materials, the whole series is offered with a 420HC steel blade and contoured red wood handles. The skinner in this premier hunting series is offered in either a guthook or standard skinning blade. Both sport drop point, 4.5" blade with a large choil for a secure grip and finished with Buck's advanced Edge2x blade technology for unbelievable sharpness and blade retention out of the box. Comes with a black polyester sheath. Made in the USA.